While you may not be able to tell it by my verbose articles, I am a devout source code minimalist by nature. Although I’m not entirely certain how I ended up like this, I do have a few loose theories. I’m probably lazy. I state this because I’m constantly looking for ways to do more work in fewer lines of code. This is probably why I’m so partial to software design patterns. I feel like once I know them, then being able to recapitulate them on command allows me to manufacturer software at a much quicker pace. If you’ve spent anytime at all playing in the software integration space, then you can appreciate how imperative it is to be quick and nimble. I’m kind of old. I cut my teeth in a period when machine resources weren’t exactly plentiful, so it was extremely important that your code didn’t consume too much memory, throttle down the CPU (singular), or take up an extraordinary amount of space on the hard drive or network share. If it did, people had no problem crawling out of the woodwork to scold you. I have a guilty conscience. As much as I would like to code with reckless abandon, I simply cannot bring myself to do it. I’m sure I would lose sleep at night if I did. In my opinion, concerns need to be separated, coding conventions need to be followed, yada, yada, yada… However, there are situations that sometime cause me to overlook certain coding standards in favor of a lazier approach, and that’s when simplicity trumps rigidity! /* A generic async service can call a RESTful Web API inside an implied $http promise. // Apply the response data to two-way bound array here! So, I ran into an interesting little challenge a couple of days ago. I was experimenting with some AngularJS code that would eventually be tasked with using SharePoint JSOM REST API’s to interact with various document libraries hosted in both SharePoint and OneDrive. 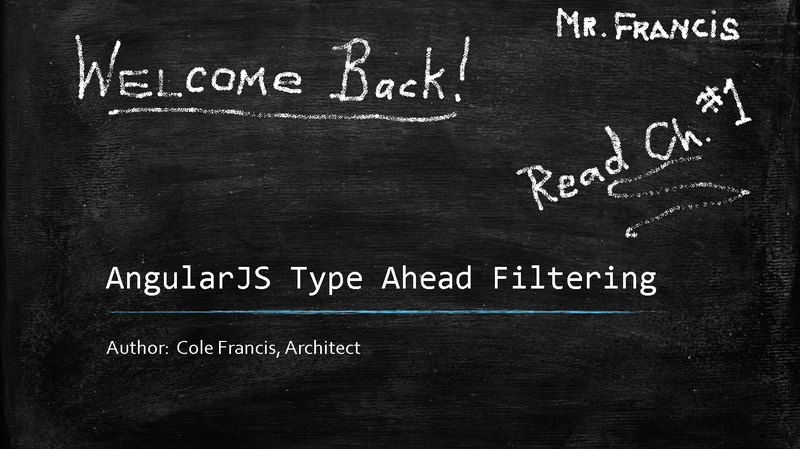 I was chiefly interested in implementing a client-side, “type-ahead” filtering solution, meaning one that filters on the entire array of records that are returned from the SharePoint server. Unfortunately, due to a staggering number of records being returned from SharePoint, some serious performance degradation issues arose. In several cases, it was taking the server well over a minute to return 10,000 rows to us. To address the lag time, we pared down the data to only include the attributes of interest to us. This helped, but the server was still far too slow. After brainstorming with the rest of the team, we decided that server-side filtering was worth a shot. Bear in mind that “type-ahead” filtering can be extraordinarily slow on the server, particularly if the GET calls are summonsed on a “keystroke-by-keystroke” basis. For example, if your very first keystroke happens to be the letter ‘s’, then you should expect to return every file name with the letter ‘s’ in it, and with that goes a sizable chunk of your time and the server’s resources. Likewise, if the next letter you type happens to be an ‘h’, the combination of the ‘s’ and the ‘h’ will cause the filter to run a little bit quicker than just a single character. But, the query would still take considerable time to complete, and the results will still be overwhelming and therefore useless to you. Obviously, adding additional characters to your search string will continue to pare down the results and improve the server’s response time. But, when it all boils down to it, you don’t really care about returning results for things like ‘s’, ‘sh’, or ‘sha’. You actually only care about returning the results for the word ‘shazam’. With this in mind, our proposed approach is to streamline the query attempts against the SharePoint server by only submitting SharePoint GET requests when user has gone without modifying their search text for an arbitrary amount of time. I’ll use 1500 milliseconds, or 1.5 seconds, in my upcoming code example. One underlying benefit of this approach is to provide a user ample time to type in a search term, as well as give them time to make modifications to it and correct any misspellings, before initiating a GET call to the SharePoint server’s REST API stack. Another benefit is that it presents the user with an illusion that “type-ahead” filtering is actually taking place, when in fact it isn’t. The impact of this approach leads us to our overall objective, which is minimizing the number of calls to the SharePoint server and yielding more pertinent and smaller result sets back to the client application. Next, we’ll need a mechanism that evaluates whether or not there has been 1.5 seconds of inactivity on the model before executing the target function, but this only applies if there have been changes to the model. What’s more, if user modifies the model within the 1.5 second threshold, then the expiration slides another 1.5 seconds before the next SharePoint REST call can be made. But, none of this should occur if the model is either null or empty. As you can see, the more I discuss it, the more complex the functionality becomes. Debounce: 1500 – Part of the AngularJS ngModelOptions, this directive tells AngularJS to update the model value using the number of milliseconds provided. In this case, I’ve specified 1500 milliseconds, or 1.5 seconds. $scope.$watch(‘delayedSearchFilter’, function(nVal, oVal) – This method signature subscribes to the ‘delayedSearchFilter’ model and gets invoked every 1500 milliseconds (or whatever the debounce duration is set to) if there are changes to the delayedSearchFilter model. I should point out that this function doesn’t fire when the model is empty or if the model hasn’t changed since the last time the function was invoked. How incredibly convenient is that? It’s like they read my mind! From my perspective, the team at Google has probably spent a staggering amount of time and money on both maintaining and perfecting the AngularJS Framework. Additionally, I surmise that a large number of developers, many who are far more talented and smarter than I am, have contributed their IT prowess to the AngularJS Framework. These things being the case, why in the world would I ever want to write my own functionality to tackle this problem when I can simply leverage their proven work?